Gilfre's House is the home owned by Gilfre at Mixwater Mill. 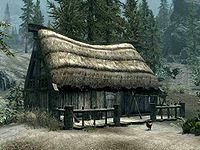 Located southeast of Gallows Rock and southwest of Windhelm, Gilfre has lived here alone since her five workers left to fight in the civil war. It is on the banks of the White River, which is used to power the mill via a water wheel. The house, a worker's house and the sawmill itself are all part of Mixwater Mill. Everything on the deck in front of the house is owned and taking anything is considered stealing. There is a rack holding four salmon and a crate with a food sack on top and a woodcutter' axe leaning against it. There is a chicken coop with three nests for the four chickens that wander the site between this and the worker's house. Also there are several blue, red and purple mountain flowers and at least one snowberry bush around the house and site. On the bank by the sawmill is a wood chopping block. The front door is novice locked most of the day and all night. It is a single-roomed dwelling containing a double bed coming out from the east wall, with a set of shelves to the left, against the north wall. These hold six common books, two leeks, a bulb of garlic and several potatoes, with several pieces of cheese and a plate containing two pine thrush eggs on top. Hanging from the ceiling above the shelves are two garlic braids, three bunches of dried elves ear and a bunch of dried frost mirriam. To the left of the shelves is a flower basket containing three chicken's eggs and to the right is a food barrel. There is an unlocked chest at the foot of the bed and to the right, against the south wall is a round wooden table with two bottles of Black-Briar mead on top, while next to the table is a tall wardrobe containing clothes. To the right of this is a rack hanging from the ceiling holding three rabbits. Opposite the entrance is a fireplace, on the south wall, with a cooking pot hanging in front and a pair of shoes by the hearth. There are eight loose septims on the mantelpiece. 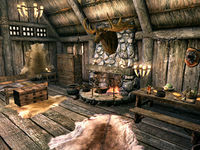 To the right of the fireplace, also against the south wall is a long wooden table and bench, with two bottles of alto wine, a bottle of wine, two bottles of Nord mead, a sprig of snowberries, a salmon steak, a potato, a cabbage, several loaves of bread and a eidar cheese wedge on top of the table, with a potion of vigor on the floor underneath. In the northeastern corner is a square wooden table and two chairs. On this table is a copy of the Archery skill book The Marksmanship Lesson, a random healing potion, a random stamina potion and five loose septims. You may choose to live here if you marry Gilfe.